Situated on the North Carolina coastline, the city of Wilmington gets its fair share of tourists. But, on this fall October 2013 day, it’s not just tourists visiting the city. There are 2,250 athletes from 42 states joining with 19 international racers to compete in PPD Beach2Battleship, which is one of the top iron distance triathlons in the world, according to Triathlete magazine. 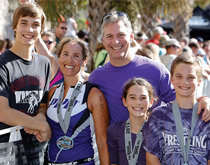 Imagine starting the day with a 2.4-mile swim in Banks Channel along Wrightsville Beach, followed by a 112-mile bike ride through several counties, and finishing with a 26.2-mile marathon that ends in downtown Wilmington. If that sounds like a bit much, there’s always the half-iron, which cuts each of the distances in half. Among the participants—in the event sponsored by PPD (Pharmaceutical Product Development)—are PPD Heroes. One of the heroes is living with cystic fibrosis. Another is a four-time survivor of non-Hodgkin lymphoma. Still another has type 1 diabetes. Each of the heroes can compete because of the medicines and therapies originally tested by companies such as PPD. Billed as a contract research organization, PPD conducts clinical trials for pharmaceutical companies, creating the infrastructure and gathering the data that allow the biopharma industry and its regulators to develop, evaluate, and approve new drugs and devices. Every product that goes on the market must be shown to be safe and effective through a multi-phase process during which the compound is first tested on animals, then on healthy human volunteers, and finally on patients. At its fastest, this process takes less than a year, but most trials take much longer. A trial process for an oncology treatment, for instance, may require 5 to 10 years of data collection and up to another 18 months of data review by government regulators before approval. PPD’s trial expertise ensures that each step of this long and complex process is executed at the highest level of quality. Most of the time, PPD’s marker of success is a drug that moves successfully from trial to market. But today, in Wilmington, the positive impact of the company’s work is embodied by people, rather than by products. 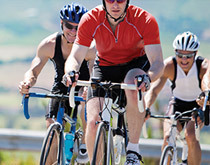 In addition to the PPD Heroes, PPD employees and their families are encouraged to be triathlon participants, at least for part of the grueling test of stamina. One of those employees, David Simmons, is taking on the bike portion as part of a relay team. His wife, Melissa, has grander aspirations. She is competing in all three legs. The two have been training together whenever they can find the time, which isn’t easy, given that they have four children (ages 19, 18, 14, and 12) and that David happens to be the CEO of PPD. But that’s getting ahead of the story. Long before there was a Mr. and Ms. Simmons, there were two teenagers growing up on opposite sides of the Ohio River. Melissa Frangos, of Yorkville, Ohio, was attending St. John Central Catholic school. And David Simmons, hailing from Warwood, a neighborhood of Wheeling, W. Va., was attending the Linsly School, an all-boys college preparatory academy. The current president of Linsly, Reno DiOrio, who became the school’s headmaster during Simmons’ sophomore year, remembers the student well. No wonder. Simmons did very well in school, particularly in math and science; started as linebacker on the football team, making all-conference; and was selected to be a prefect in student government. “Headmasters aren’t supposed to have favorites …,” says DiOrio. But the way the sentence remains unfinished speaks volumes. As a result, in 1982, he enrolled at CMU to study applied mathematics and play football. By freshman year’s end, the academic prowess that so impressed DiOrio in high school wasn’t evident in Simmons’ CMU grades. So he did what would have been unthinkable a year ago. He quit football and “buckled down.” By the end of his sophomore year, he’d picked up a second major, industrial management, and his grades, becoming a regular on the Dean’s List. After graduating in 1986, he landed a software engineering job at Wheeling-Nisshin Steel. A capable learner and a natural leader, he was promoted in short order from designing computer systems to running the nascent software department. By 1988, his string of promotions led to a position at Thypin Steel Company in Long Island City, N.Y. Along the way, he began seeing the girl from the opposite side of the Ohio River. He and Frangos had been in similar circles for years, but she was four years younger, and they’d never really gotten to know each other. But in September 1990, during Frangos’ final year at Ohio State and at the start of Simmons’ career at Thypin, their timetables—if not their geography—finally matched up, and the two went on their first date. They must have hit it off, because five months later, with only monthly visits (and no emails!) between New York and Ohio, the two were engaged. Almost simultaneously, Simmons entered a period of major challenges at work and (in the form of a growing family) major changes at home. His work at Thypin had caught the eye of his employers. But they weren’t just thinking of promoting him; they were thinking of asking him to switch fields. They suspected that the leadership skills he’d shown in the technology sector would transfer to general management, where they were in need of someone to tackle an unenviable task: shutting down a union steel facility in Long Island City, Queens, and starting up a new, nonunion plant in Pennsylvania. The project was complex and divisive, the kind of incendiary move that would provoke death threats against those in charge. Simmons took on the challenge (and did receive the threats), but he says he emerged from the negotiations a stronger leader and seasoned manager. After the move was complete in 1996, he started receiving frequent calls from recruiters who had multiple executive openings in the burgeoning information technology sector. Simmons let them know he’d be interested in a leadership role with a blue-chip company that entailed living overseas. Except for a three-month trip to Japan through his job at Wheeling-Nisshin and his time in New York, “99.9% of my life was within a 65-mile radius,” he says. He wanted to experience more of the world. His wife, who had also come from a family of modest means, shared his adventurous spirit. He ended up at Pfizer, the world’s largest research-based pharmaceutical company, in charge of its technology group, located in England. Four years later, in 2000, he took over Pfizer’s pharmaceutical business in Greece. Tasked with increasing sales, he delivered. In less than five years, he quadrupled Pfizer’s business in the nation, from $95 million to over $400 million, largely through cholesterol-awareness programs that increased sales of the drug Lipitor. More promotions followed. Each title change was accompanied by a move, from Greece to Canada and finally back to the United States, where the family of six settled in Connecticut in 2007, after Simmons was Regional President Central and Eastern Europe. Within three years, he became Divisional President of two of Pfizer’s business units, Established Products and Emerging Markets. Together, the units had 19,000 employees and annual revenue of $20 billion. Simmons reported directly to the CEO of Pfizer. Life was good, he says. But then came an unexpected call from two private equity firms. They wanted to know whether he’d be interested in moving to another aspect of the biopharmaceutical industry as CEO of PPD. He says the position appealed to him because in a contract research organization such as PPD, which works with a number of pharmaceutical companies, there is a chance to witness, in Simmons’s words, “a much richer swath of innovation in health care,” a chance to be a part of progress every day, to explore a deeper cross-section of drug development, and to work in a service-oriented, rather than product-oriented, business. Their decision was also made easier by a trip to Wilmington, N.C., the location of PPD’s headquarters. Instead of a daily 90-minute train-ride commute from Connecticut to New York City, Simmons could have a scenic drive to work. And the family could live within jogging distance to the beach, a perk that easily won over their four kids. From a professional standpoint, Simmons would be at the helm of one of the leading companies in a growing field. Despite the raised eyebrows of some in the industry, Simmons decided to leave his executive position at Pfizer. 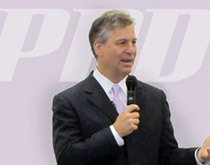 He started as PPD’s CEO in 2012. And, in addition to the extra family time and sense of community he’s found in North Carolina, he says he’s also found a sense of satisfaction in the scope of PPD’s work. Because the company works with a multitude of pharmaceutical clients, PPD has a hand in the development of as many as 400 drugs and therapies at any one time. The company’s work ensures that every compound is studied swiftly and thoroughly, so that the best products can get onto shelves and into hospitals sooner rather than later. In the long run, the clinical trials run by PPD may help to create more effective treatment options for some of the most life-altering diseases. And, in the immediate term, a positive outcome on a trial—even years before a drug may go to market—may change the life of a patient who has exhausted the existing roster of treatment options. Running an organization that spans 84 sites, 46 countries, and 13,000 employees is a logistical puzzle, but Simmons says his career has given him the tools to keep the company balanced. Karen Kaucic, the vice president and global head of PPD Consulting, points out that Simmons’s 16 years at Pfizer gave him an invaluable perspective: an understanding of what the pharmaceutical company clients of PPD need. His understanding of drug development, she says, has provided PPD with a “tremendous new lens” through which to see opportunities for collaborative innovation between CROs (contract research organizations) and biopharma companies. Simmons, it seems, is far from exhausted. If anything, whether in a boardroom or competing in the triathlon, he says he is energized by the challenge. And though his wife is the total triathlete, he is, to carry on the salmon analogy, swimming hard and always going forward.